Why Do Jews Love Jerusalem? The Jews’ love of Jerusalem as Judaism’s permanent capital stems from the Torah itself. The Holy City is referenced hundreds of times throughout Tanach (the Five Books of Moses, Prophets and Writings, also known as the Written Torah). The Talmud elaborates in great depth on our bond with that city. On the other hand, it is never mentioned in the Koran, no matter what is claimed by the Muslim world. The answer is it is true that G‑d’s presence can be experienced everywhere at any time. That is because G‑d is unlimited, and indeed created both time and space, and so He is superior to both. Nonetheless, the Torah (a creation of G‑d that also supersedes time and space) decrees that there are special times and special places. As the Torah represents G‑d’s immutable will, we see that the holiness of Jerusalem does not waver nor diminish. It has always been, and will always be, the holiest place in the world. 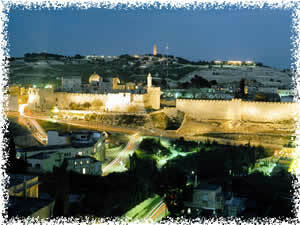 In fact, we find that the holiness of Jerusalem surpasses that of Mt. Sinai. That is because the holiness revealed on Sinai came through G‑d’s initiative and revelation to the people. The people themselves did not cause the giving of the Torah to occur. On the other hand, the holiness of Jerusalem was cemented by the efforts of humankind. It was human hands that built the Holy Temples and consecrated the ground of Jerusalem. This adds to its permanent holiness. King David, great prophet that he was, purchased the land for the Holy Temple from the local inhabitants, knowing full well the holiness of the site. It was, after all, on that site that Abraham offered Isaac as a sacrifice. It was on that same site that Jacob laid down his head and had his prophetic dream of angels on the ladder. The site of the Temple is a veritable gate to heaven found here on earth. The Jewish heart stirs upon approach to the last remnant of the Holy Temple that we have. The Wailing Wall, also known as the Western Wall, was built as a retaining wall during Herod’s renovations of the Temple Mount above it. Oh, the stories the stones could tell! All of the heartache and suffering of Jewish history is contained in those massive stones. Millions of tears have been shed, and millions of prayers have been uttered, in that holy place. The lower stones have been polished by the hands leaning on and caressing them, as countless Jews have touched their hallowed surface, attempts to touch the “Face and Heart of G‑d,” as it were. Rabbi Yeruchem Eilfort is director of Chabad at La Costa, California, and welcomes readers' comments and questions. Jerusalem -- in Hebrew it is Jerushalaim = which stands for Jerusha = heritage ( יְרוּשָׁה ) la’em ( להם ) which means : to them. Thus it means "their (=the Jews) heritage”. Jerusha means heritage,inheritance, la’em means to them, thus their (the Jews) heritage. That's what my Hebrew teacher, Chief Rabbi Medalie taught us in the Hebrew classes in 1969-1970. That's how it was explained to me when I was living and working as a Registered Nurse in Jerusalem. Peace in Hebrew is "shalom" (in Arabic it is "sala'am" which has nothing to do with the "salem" of the English word Jeru"salem"
I am by no means a bible (Torah) scholar but I would have to conclude that Jerusalem was originally just called "Salem" We do find this mentioned in Gen 14:18: [ Abram and Melchizedek ] Then Melchizedek king of Salem brought out bread and wine; he was the priest of God Most High. yerushalayim Yerushalayim is the place of Shalom and where the Heaven and earth gets mingled. I'm happy to share it is the capital of whole universe. Jerusalem Israel's capital I believe anyone who believes the Word of G-d knows that Jerusalem is G-d's holy city as it is written in 2 Chronicles 6-6 "But I have chosen Jerusalem that My Name might be there."